Mirai4Production is designed for those companies characterized by mass production processes and high production volumes, whose competitiveness is subjected to machines' efficiency and productivity. Mirai4Production is Miraitek’ tool for production plants remote monitoring. Mirai4Production is compliant with Industry 4.0 standards: it enables communication between machines and with the users. Mirai4Production is designed to increase machine's availability through continuous monitoring of the resources. Mirai4Production provides real time information about machine's status: data are available on fixed, mobile and wearable devices. Mirai4Production allows the customers to remotely monitor the production, achieving operational efficiencies thanks to increased machineries availability. Machine's operating data are collected to provide information about plant' productivity. The system provides aggregated data about the Overall Equipment Efficiency (OEE) of the plant as well as the performances of a single production station. The intuitive and user-friendly interface helps the user to immediately and clearly visualize the active problems and solve them promptly. Mirai4Prodution displays real time alarms: they can be set on user-created conditions or they can inform about real anomalies on production. Miraitek solution allows to quickly intervene on machines stops, reducing downtime and improving plant productiveness. Companies benefits of better quality productions, lower costs of productions improving its competitiveness. Mirai4Production exchanges data and information with management (MES, ERP) and production software, enhancing production optimization as well as supporting decision-makers and management processes. Mirai4Production allows to profile users and to archive data on a relational database, even in the Cloud. 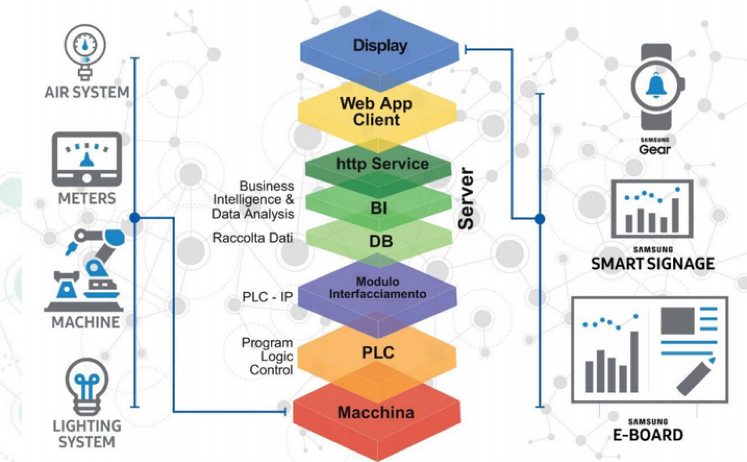 Field operating data are collected from machine’ PLCs and once processed they can be transferred to MES systems (Manufacturing Execution System). Mirai4Production allows the user to upload documents (product sheets, production plans, training videos, maintenance sheets, etc.) that become available at each station. Users can also create reports in PDF format to perform ex post analysis.